Yesterday, as I was cleaning my cupboard, I found ‘Letters from a Father to his Daughter’ lying among my old books. The very first sight of the book reminded me that I had got it when I was just twelve years old. However, I overlooked the book as it felt slightly jaded and old in comparison to colorful Diamond Comics, I was in love with. However, as I had just finished reading ‘The Story of My Experiments with Truth by M.K. Gandhi’, I thought it was a natural progression to read the work of Nehru, one of the self confessed disciple of Mahatma Gandhi. If you have read my previous review, you can guess that I really appreciated the candid confessions and honest portrayal of Gandhi in his autobiography. And, as is the folly of human mind, I very much expected the present book to be a similar insightful experience, especially as I nostalgically remembered my childhood and the experiences I missed while reveling in the comic world. So, with slightly trembling fingers and fluttering heart, I opened ‘Letters from a Father to His Daughter’. 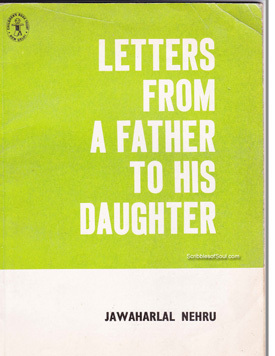 The book is a collection of letters written by an affectionate though slightly pedantic father, who is not able to spend enough quality time with his daughter, owing to his political obligations, and thus tries to form a bond with her by writing letters to her from prison. But, these letters are not the usual communication between a father and a daughter. They neither talk about daughter’s dreams nor the father’s worries or expectations, but are an effort at the daughter’s education, especially her outlook towards her country and world at large. Nehru begins with the very beginning, he talks about how the universe was created, much in the same way, as we read in the text books. And, then he slowly moved on, telling the story of Evolution and Birth of Human beings, in the easiest of words and in the most straightforward manner. His description is extremely bookish, but still attracted me as would a simple bedtime story. Till this time, I really thought that perhaps this was the easiest way to learn history and geography. A parent can be the best teacher and Indira Gandhi was really lucky to have a highly educated father, who could explain the most complicated phenomena of Nature and Science in such an easy way to her young girl. But, as I carried on, there was a sudden shift in the tone of letters. The writer seemed biased against a community. Brahmins were displayed as bad men who tormented and exploited people and spoiled the peace and well being of humanity. They were supposed to corrupt the minds of Rulers, making hell out of the lives of masses. I do understand that when Nehru wrote these letters, the country was going through a cultural, social revolution and the old fetters of religion and castes were being mutilated to let the humanity breathe. But, to inculcate such prejudices in the mind of a eight year old is a bit too much. No doubt, a father has the liberty to share his views with his children, but kids should be allowed to nurture in a bias free world. And, I think by writing ill of one community, a great disservice is made to the society at large. Gandhiji was also against exploitation of poor, but I did not find him indulge in straight mud slinging in his autobiography at least. However, thankfully, the above prejudices lasted only a few pages, and as Nehru moved onto the creation of old cities of Egypt, Paris and Rome, giving references to the museums and monuments, Indira presumably visited during her childhood, I found the book turn back to its initial tone of familiarity coupled with information, an essential ingredient in a child’s education. So, overall, the book is readable and at times interesting, though I am two decades late in discovering the book. But, it has strengthened my perception of Nehru as a natural thinker and has made me more curious about his “Discovery Of India”, I hope to read some day. I need the same letter in Telugu…is it possible….? ?